This is a fictionalized anecdote of someone I know, respecting only the premise of two young people who love each other, have to hide their affair and ended up being separated by their own mistakes. Based on this, I developed the story, then contacted a few skateboarders in Mexico city that read the script and I got from them observations on how they would feel closer to my characters. They also have had bisexual experiences as well like my characters. The idea is to make a male love story, in which emotions have to be contained, and the silence and actions have much more impact. The guys I am going to work with, skate all day long, I want that street and dirt flavor on my story. They have a punk attitude in life, the present is what really matters, there is no future, only keep on skateboarding to the end. They relate to a group of friends as if they were a clan. This works for my movie, I want to focus on people who engage in criminal activities but ignoring the commonplace, my criminals won’t look like criminals, they will look dirty though. They are ordinary guys who are passionate about an extreme sport and they want to live the present, as often happens with people who end up involved with crime. Johnny and Miguel skateboard in traffic, not even caring if there is a red light or not. They criss-cross the city; both of them are less than twenty years old each, sweated and with scars, but feeling beautiful. 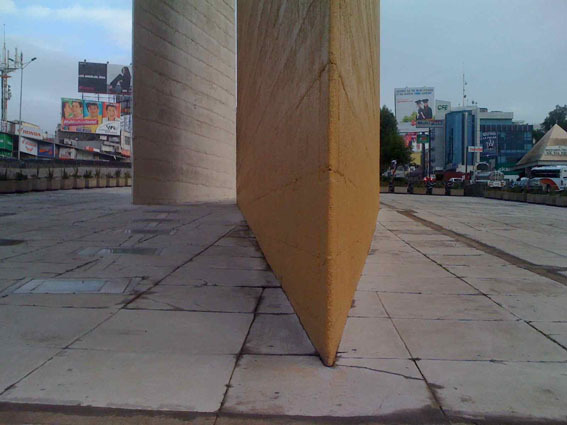 They move as if they are the only inhabitants of Mexico City. They love each other in secret. Every night Miguel flees his house to sleep with Johnny in a warehouse used as a small apartment, and early in the morning goes back home to pretend he is sleeping in his own bedroom. They know each other since childhood; Johnny used to live at Miguel’s home when they were little, because his mother was working there as a maid. Johnny works in a Jai-Alai court, the owner of the place traffick drugs and used the place as a front. Johnny takes advantage of his boss carelessness to steal drugs from him. Miguel sells the drug where they skate. They engaged in low profile drug dealing in a very naïve way, and get very excited about what they earn. Suddenly Johnny’s boss disappears and they take advantage of this incident to steal all the drugs, without contemplating the consequences that can come up from such wrongdoing. This error causes that Miguel parents take action on the matter. He is sent to Texas and gets a job in a Modern Arts Museum. His job is to take care that nobody touches the art pieces and to stand still for hours in front of a painting by Francis Bacon. His parents promise to help his friend Johnny out of trouble, but they do not deliver on that promise, it was the ideal opportunity to distance their child from what they think is a bad infuence for him. Both get separated unvoluntarily by the circumstances only knowing that without each other life has a different meaning. Johnny does not survive the world of crime. Miguel knows that his ability is to sell and searchs for someone to do business with. I intend to make a story that is very organic, give the impression that we are observers, following with a glance these kids. I want my characters to speak from a side view, giving the impression that we are witnessing a conversation in which we are not involved but witnessed. The ambience and art of my film is given by the locations, many scenes were written based on the location. Seeking a feeling of a simple story, with few elements that is enriched by each of my characters situations, I want to get away from the idea that the setting is perceived as an element that is born on the script, but rather than the ambiance is a refuge or natural area of my characters. Production for the movie, to raise more money in the other contries. We gonna apply to Foprocine of IMCINE from Mexico, where is possible to obtain 300 thousand dollars. On the other hand from December, 2011 we are in negociations with the tennis brand Vans, this negotiation is with the Matrix of the brand in California, USA. With them it is possible to obtain 100 thousand dollars. Also we are having conversations with Texas Cristian University, in Forth Worth, Texas. City that is one of the location of the movie. Ciudad Satélite, México. Forthworth, Texas, USA. Sistema Nacional de Creadores, FONCA, Conaculta, México.